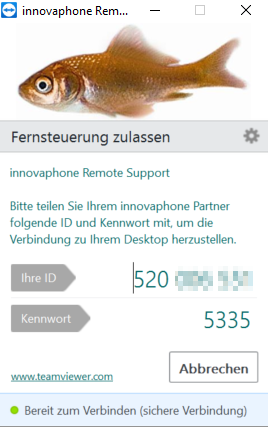 For more efficient support, innovaphone applies a remote support strategy using the familiar TeamViewer utility. This allows our support personal to access the installation online under the customers full control. Here is how it works. To allow access to the installation, the customer needs to start the teamviewer client component on a machine that is located in the installation network. This can be just any PC with internet access. There is no formal installation required to start the tool, so no administrator rights are required. Access to the installation is possible only as long as the tool is running, and the customer has full visibility of what is going on during the session. The customer can hand over control to the support personal and the support personal can share their own desktop with the customer. Filetransfer is possible under the customers control. To start the session, simply download the client executable from http://wwwold.innovaphone.com/demo/TeamViewerQS.exe. A session ID and a password will be generated specifically for this session and the customer needs to share both with the support personal. It can be useful in certain situations to allow permanent remote access to servers, even across re-boots. This requires special installation. Discuss with innovaphone support personal if need be.